The active adult community now features new and redesigned homes and a completed clubhouse. Club Verona is the lifestyle center of Villagio, a luxury active adult community that has seen the construction of 20 new homes in the past year. “These new homes offer a chance for active adults to become part of a thriving community without downgrading to a smaller space,” said Jeri Gaita, Sales Associate at Villagio. Villagio is starting the season by inviting homebuyers to visit its new homes and view the newly redesigned Veneto model plans. The active adult community has seen the construction of over 20 new homes in the past year and has recently finished construction on Club Verona, a lifestyle hub where residents gather for classes and events, which is now open. Located in Monmouth Junction, just minutes from downtown Princeton and convenient to I-95 and train service to Philadelphia and Manhattan, Villagio offers a picturesque setting with amenities such as a tranquil reflecting pond, jogging path, amphitheater, bocce court, putting green and the newly opened clubhouse for residents’ enjoyment. Homeowners at Villagio gather at Club Verona, the social hub of the community. The clubhouse offers a hotel-inspired lobby, game rooms, dining room, gym and lounge, as well as an outdoor pool with terrace and dining pergola. “Club Verona is quickly becoming a lively community center for our nearly 70 homeowners,” said Gaita. “They’re using the space to relax and work out together or partake in yoga and wellness classes.” Prospects are invited to tour the recently finished clubhouse when visiting Villagio. Villagio also offers the chance for homeowners with adult children to become a part of a lifestyle community. Unlike many other active adult communities in the area that have a minimum age requirement of 48 years old, family members only need to be 19 years of age to live at Villagio with a qualifying occupant 55 or better. The community offers home designs tailored to families with adult children that feature two master suites and spacious layouts. Interested homebuyers should call 732.329.4200 or visit Villagio55.com to become a Villagio VIP and be the first to receive news and updates. 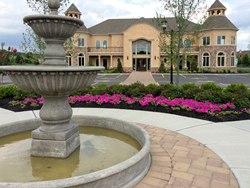 The Villagio sales office is located at 81 DaVinci Drive in Monmouth Junction. Villagio is a community by Byron-Hill Homebuilders, one of the most successful builders of luxury estate homes in the New York and New Jersey metropolitan area.